We don't do takeaway in our home very often. It's a big treat for us, and when we do, our takeaway of choice is Chinese. It's a winner for the whole family and very easy to supplement at home with boiled rice and spring rolls. As you can imagine, Chinese takeaway and delivery for my family of 5 is not cheap. I am a comparer of prices, a user of vouchers, a picker upper, anything to bring the price down a little. I've recently been introduced to Menulog and was happy to find that plenty of my local resteraunts are included on their site. 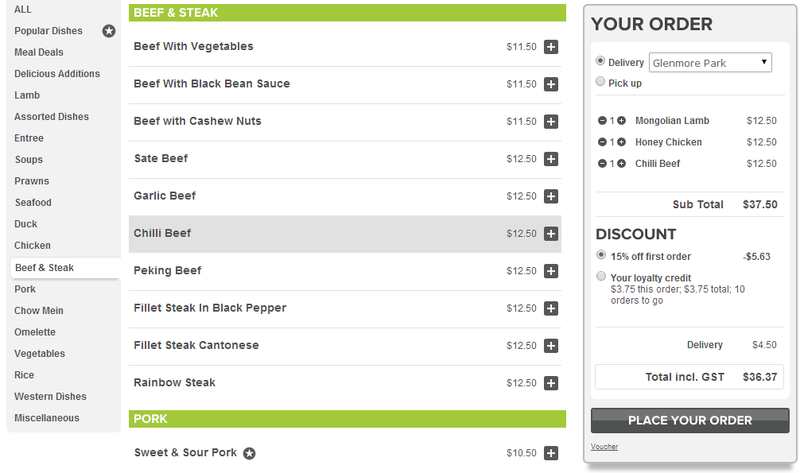 Menulog acts as a kind of aggregator for local eateries, and facilitates the order between customer and store. The process was definitely smooth and easy, but the question arises, why would you order from Menulog instead of going straight to the store? After giving it a trial run for our Monday date night with Maddy, I've got a few really good reasons! Easy Price Comparisons. There was a $7.80 price difference between two of my locals just for our standard order. Transparent delivery costs. 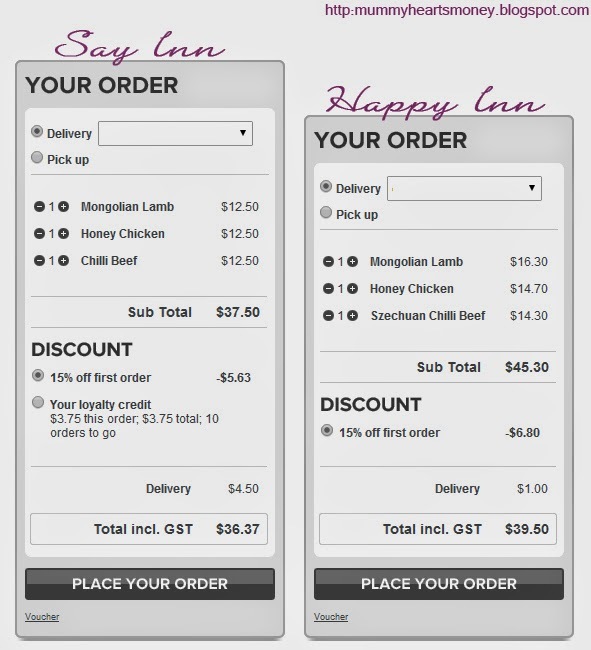 The food delivery cost is factored into the calculation immediately. I've been caught out before ordering from the restaurant I thought was cheapest only to find out they have a high delivery fee. First Order discounts. I've never seen any of the local pamphlets be delivered with an offer like but many of the Menulog restaurant subscribers offered a discount. Loyalty Credits. Don't want to shop around each time for a new First Order discount? It's possible your favourite takeaway provider offers loyalty credits to be accumulated against future purchases. It would never have occurred to me that I could get a cheaper price on my takeaway without resorting to coupons, so I love the different incentives Menulog offers. Shopping at Menulog was a simple and quick process, not only can you order online on your laptop or desktop, you can also order using the iPhone or Android app. 1. Enter your suburb or postcode. 5. Easy payment using Credit Card, Paypal, Cash or Vouchers. 6. Sit back and wait for your food to arrive or be ready for pickup! I was a bit nervous about whether or not the order would be received smoothly via a third party ordering system, but I received a confirmation email AND text for the order which set my mind at ease. 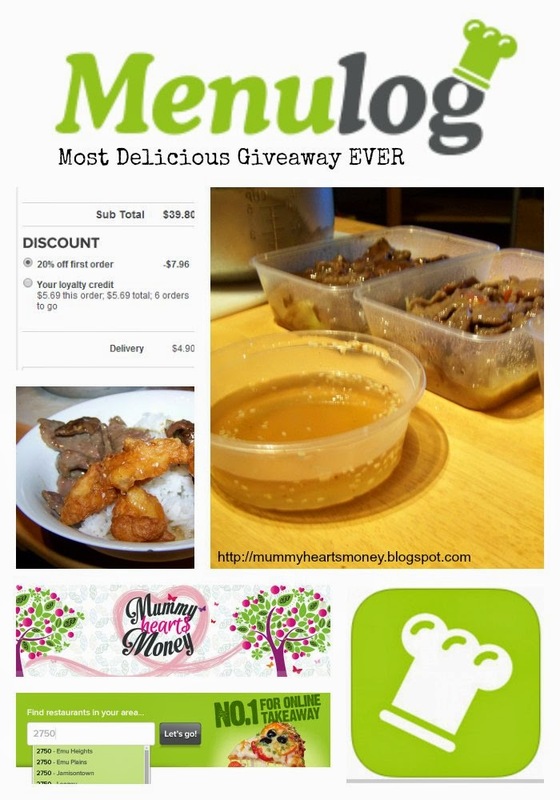 If you'd like a chance to try out Menulogs easy ordering system for yourself and take a night off from cooking Menulog have very kindly given Mummy Hearts Money a $30 voucher to giveaway! Entry is super easy. Tell me a yummy Chinese dish (NOT one of the ones that I ordered from Menulog) that you think my husband would like to try. I will let him pick which one we should try out next time we order Chinese. *Hint* My husband is Muslim, so he doesn't eat any pig related products (Pork, Ham, Bacon). Other than that there are no other foods he would rule out - he loves to try new dishes! 4. Entries not answering the question will not be considered. 6. If winner does not make contact within 48 hours, a new winner will be selected. 7. This is a game of skill and winner is not subject to chance. The best thing ever is Combination Omlette, try it, I bet you'll love it too! Garlic prawns and chicken and corn soup. Yummy !! HAS to be lemon chicken, so long as it's crispy! Chicken and cashews- just bags going first to get a good amount of cashews!! Otherwise you could always skip mains and get fried Icecream- wonder how that would be as a takeaway- ha ha! you have to have Spring rolls, can't order chinese without an entree of these to devour!! I love Mandarin anything, but the Mandarin Beef I had last time was to die for, think I might get some tonight now, as we have after school swimming! Tell hubby he has to try chop suey with crispy noodles, its full of vegetables and any meats you choose in a delicious garlic sauce perfect for keeping the winter colds away! He's got to try Lemon Chicken!